Special saving on this great value hi-fi package combining the Onkyo A-9010 Integrated Amplifier, Wharfedale Diamond 220 and Pro-Ject Essential III turntable. The Wharfedale Diamond 220 is the hotly anticipated replacement for the hugely successful 121 range of entry level bookshelf speakers. Project Essential III is perfect for those who enjoy music above all else. It features isolation feet, a low vibration motor with DC power supply and a great quality Ortofon cartridge for class-leading sound. 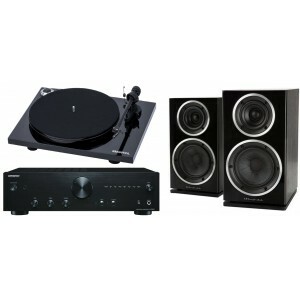 Available in black high gloss as standard with this package, you can also choose between red or white by contacting us. The affordable A-9010 has specially modified circuitries and four audio-grade capacitors to deliver warm, full-bodied sound from your LPs and CDs. It also includes an MM phono equaliser, independent headphone amplifier and gold-plated speaker posts.